The Prime Minister, two-faced Theresa May, is at it again. 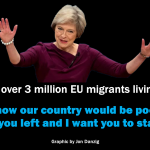 On the one hand she says three million EU migrants in the UK are too many; they take our jobs, they cause a burden to our housing and hospitals; they have zero value. On the other hand, she says we need you all, we’ll be poorer without you, please don’t go. Can anyone ever believe anything this duplicitous woman says? Oh, don’t give me that forked tongue nonsense Mrs May. For years you have been saying that Britain has too many EU migrants, and we need to bring numbers down to a trickle. If that had happened, we wouldn’t now have the three million EU migrants you now say the country can’t do without. People believed you when you said Britain has too many EU migrants. Why do you think they voted for Leave? They voted so those migrants would Leave. They voted because you said you’d bring the numbers down. Now you’re saying we need them all. There weren’t too many after all. The country will be poorer without them. Do you really know what you’re doing? You’re messing with people’s heads; and their hearts, and their lives. What you are doing should be a criminal offence. You think you can wave all this away with a Happy Christmas? For 18 months since the EU referendum result, you have let EU migrants here suffer whilst they have not known whether they can stay here on the same terms as they are here now. The answer is clearly no. Their rights will not be as good as they’ve got now. (Ditto UK migrants living across the EU). If you sincerely think that all the hard-working, upstanding, law-abiding, tax-paying EU migrants in the UK are needed and wanted, why didn’t you say so before the EU referendum? 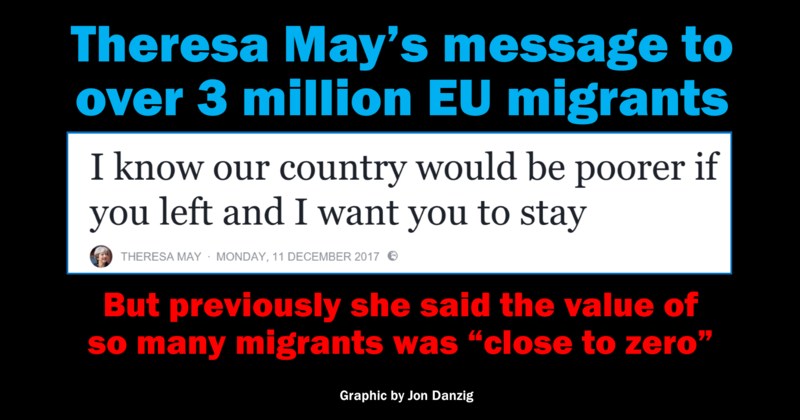 Instead, at the Tory conference immediately prior the referendum, you said the current numbers of EU migrants in the UK are of zero value. Yes, you did. High immigration to you then represented the three million EU migrants in the UK. You blamed too many foreign students (how can you possibly call students migrants?) and too many EU migrants. You quoted your party’s manifesto, ‘we must work to control immigration and put Britain first’. Now you say, ‘I know our country would be poorer if you left and I want you to stay’. Now you say that those three million EU migrants are welcome here, when you previously made clear that you didn’t want them here. Now you say you are proud that those three million EU migrants made their homes and livelihoods in our country, when you previously said they were stealing our jobs and putting pressure on our schools, hospitals, homes and wages. 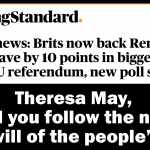 Do you really understand what is true and untrue, Mrs May? Because you cannot have it both ways. I will tell you the truth, which somewhere nestling in your heart and soul you must surely know, even if it’s a truth you are not principled or honest enough to say. You know bloody well that the UK needs those three million EU migrants here, even though you and your cohorts made it absolutely obvious that those three million EU migrants weren’t wanted or welcome here. They are needed because Britain has far more jobs than Britons to do them. You know that. That’s why you dare not let those EU migrants leave, even though you previously said you hadn’t wanted them to come here in the first place. You know that if those EU migrants go (and thousands already have – around 10,000 from our NHS alone in the past year) then we will not have enough Britons to do all the jobs in Britain. You also know that it’s a lie that migrants are stealing jobs, bringing down wages, and putting pressure on schools, homes and hospitals. EU migrants are not stealing jobs. We have the lowest level of unemployment since 1975. We have more British people at work than ever before. Yes, we have too many Britons struggling, on unwanted zero-hour contracts, on wages that haven’t gone up in years, on having to use food banks, and only just getting by. But you know, yes you do, that that is not the fault of migrants. It’s your fault, Mrs May. Yours. Yours and successive British governments who have miserably failed to invest sufficiently in the infrastructure of our country, to ensure that we have enough homes, hospitals and schools to adequately accommodate ALL the workers the country needs, whatever their nationality. You know this. That’s why it is so convenient for you to blame someone else. Migrants. But now the truth is dawning. Because if you act out your nasty, racist, xenophobic rhetoric that we have too many migrants, and they go, our economy will crash. And then Britons will have even fewer jobs, homes, hospitals and schools, and even lower wages. And then you won’t be able to blame migrants anymore, because they won’t be here, or at least, not in the numbers you previously said were too high, but now magically say are all wanted and needed. The fact is that migrants are making a massive net contribution to our Treasury and our economy. Figures released by HM Revenue & Customs show that in the 2014 tax year, EU migrants here paid £14.7 billion in tax and national insurance, but only took £2.6 billion in tax credits and child benefits. That’s a huge profit for the country, Mrs May; money you should be using to invest in more schools, hospitals and housing. But like your Brexit Secretary, David Davis, you are not interested in evidence-based politics and policies. If you were, you would take on board the considerable volumes of evidence that EU migrants are a boon, and not a burden to us. 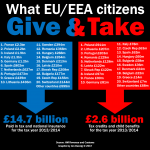 EU immigrants pay more in taxes than they use public services and therefore they help to reduce the budget deficit. The areas of the UK with large increases in EU immigration did not suffer greater falls in the jobs and pay of UK-born workers. EU immigrants are more educated, younger, more likely to be in work and less likely to claim benefits than the UK-born. European immigrants who arrived in the UK since 2000 have contributed more than £20bn to UK public finances between 2001 and 2011. Those EU migrants endowed the country with productive human capital that would have cost the UK £6.8bn in spending on education. What’s more, EU migrants – all migrants – enrich our country in so many more ways than just economically. What’s that, Mrs May? You don’t believe the evidence? Oh, that’s also the common response of Brexiters, who must now be very confused by your welcoming of three million EU migrants that previously you said were unwelcome. Well get this. I don’t believe anything you say. You are not fit to be Prime Minister of the United Kingdom. You are disuniting our country and our people in a most nasty, despicable way, and destroying the reputation of a once fine, tolerant and progressive country. The sooner we have a true statesperson leading us, who puts the country and its people first, the sooner Britain can be Great again. 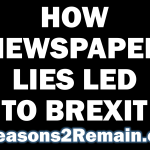 This entry was posted in Current Affairs, Democracy & Citizenship, Economics & Trade, Politics & Public Policy, Society & Culture, The EU, Uncategorized and tagged Article 50, brexit, EU migrants, EU referendum, European Union, hypocrisy, immigration, Theresa May. Bookmark the permalink.